I’ll admit, when I first saw Iron Man Armored Adventures on the shelf I thought it was the Madhouse created Iron Man Anime that looked so cool when its first trailer debuted back in 2009. To say I was disappointed to find that it wasn’t that anime project is an understatement. So with my hopes already dashed before I’d even seen it could Iron Man Armored Adventures win me over? 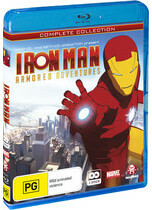 Iron Man Armored Adventures follows the adventures of a teenaged Tony Stark. After his father is killed in a plane crash and he is left seriously injured Tony Stark becomes Iron Man using technology he created for the suit to keep him alive. He uses his new found superhero status to track down why his father was killed and thwart numerous enemies who try to harm him or his friends Rhodey and Pepper Potts. The series contains elements that fans of the Iron Man character will instantly recognize, like Pepper, Rhodey and a host of villains like Obadiah Stain and the Mandarin, but the series puts its own unique spin on the character and the universe. The series doesn’t just rest on pre-existing Iron Man material as it introduces a host of new characters to help make the series its own. Unique spin also means kids spin as the focus is definitely on kid’s entertainment here, but there’s still some fun to be had with Iron Man Armored Adventures. Sure there are many things that existing older fans will find annoying, like Tony’s surprisingly good relationship with his father and the similarities between a young Tony Stark trying to juggle school and being a hero with Peter Parker/Spider Man, but there’s some pretty high octane action going on and some quality hero and villain character designs, especially old series favorites that will appeal to the younger target audience and older fans. The change to Tony being a genius teenager and not a womanizing alcoholic is hard to swallow but it’s been made with a younger audience in mind. These changes make the young Tony Stark a bit of an annoying little brat. He’s got a bit of that spoilt rich kid thing going on and a rich man’s Peter Parker is nowhere near as interesting. Over the course of the series he also develops a bit of that “I have to do this alone” mentality that sees him push away his friends, which doesn’t help you to like him. Pepper is also ridiculously irritating as the ‘never shut up’ daughter of an FBI agent. Pepper was great when Tony and her would constantly flirt and go back and forth with their employer/employee relationship but as school yard friends their relationship is nowhere near as interesting or fun. Rhodey, surprisingly, is still the ever reliable best friend who, as we’ve come to expect from Rhodey, is often the voice of reason when it comes to Tony’s latest actions. He was probably the only main character I could relate too because he was very similar to his traditional character. The story largely focuses around Tony trying to find out what happened to his dad and growing into his role as a superhero. There are several continuing plot points throughout the series, which relate to the villain Iron Man is currently facing. There’s usually some sort of message to every episode, which you’d expect from a kids show, but the real highlight of the series is the action. Interestingly the whole series has a focus on father’s due to the young characters and responsibility/accountability. While the character animations for the heroes and villains looked good and the action was largely well done overall Method Animation’s 3D CGI was not impressive. The characters didn’t look natural when they were walking around performing everyday tasks and their faces were particularly poorly animated. The matchup between words, facial expressions and lip sync were not good. Also you had a feeling that the characters had been layered over the top of the background and were two separate entities not one cohesive animation. Even in the action there were things that needed to be more detailed, like the effects of battle damage that would have made for a more engrossing viewing experience. They also use some random slow motion scenes that seemed out of place in the overall production. The Blu-ray is presented in 16:9 widescreen 1080p HD. The colors were bright, clear and well defined but it’s hard to comment on imperfections with the image, not being familiar with the 3D CGI format and its conversion to Blu-ray. To me the transfer looked fine and any faults were more due to the animation than the transfer. The voice acting was okay but didn’t really stand out as being overly impressive. Interestingly the audio is only presented in English 2.0 LPCM so there’s a lot of focus on the front end. The track was loud but suffered from not featuring full surround sound. Repulsors and lasers sounded good but a few of the guns didn’t sound right, emitting a very metallic noise. The complete collection unfortunately does not come with any bonus features. 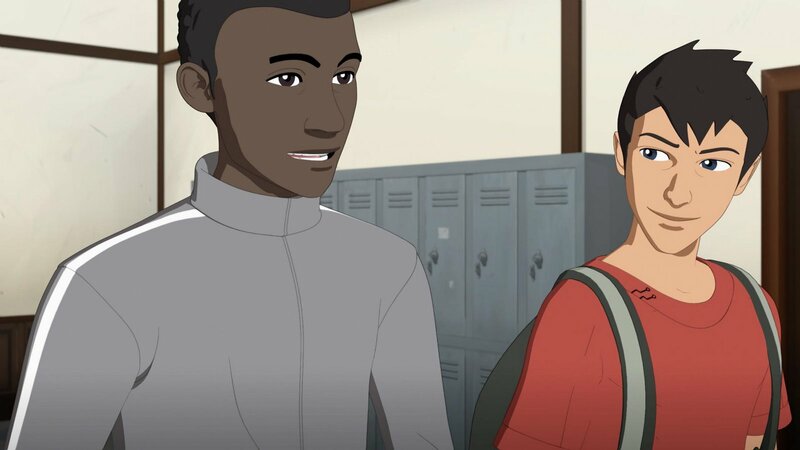 Iron Man Armored Adventures is a kid’s show that’s looking to capitalize on the success of the live-action Iron Man films. In that respect it probably succeeds as there’s a lot of action, a basic but interesting plot and a main character who probably appeals to kids due to his wealth and ability to create whatever the hell he wants while he breezes through school. The animation won’t be everyone’s cup of tea and it certainly wasn’t mine while the audio suffers from a lack of surround sound and longtime fans will be annoyed by key changes. Definitely one for younger audiences.